Believe it or not election night is upon those of us here in the United States, and although it seemed the political commercials, mailings and phone calls would never end, it will all be over in about 36 hours. With all the time you have invested in researching propositions, and making yourself knowledgeable about the candidates and issues important to you, it would be a shame to miss a second of coverage. such apps so you don’t have go through the trouble. One will be an iPad app, one for iPhone and one that has been released for iPhone, Android and Blackberry, just in case you are stuck at work or on the road when you need your election coverage fix. 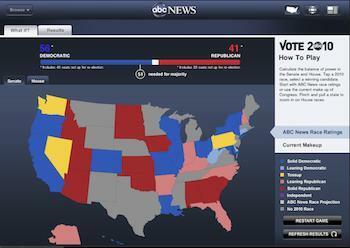 The ABC News App for iPad will keep you up to date on results starting at 7 PM EST Tuesday evening. Simply tap on the “results” tab and you will see an empty map the House and Senate and will start filling up, color coded of course, based on who wins in that area. ABC has also built in a fun little “What if?” feature that will let you see how different outcomes will affect the races as a whole. The ABC News App is free for download so go grab it and spice up election nice from your iPad. FOX News has launched it’s America’s Election HQ app for the iPhone that will keep you up to date with races, as well as let users dig deeper into issues that are important to them. This application will break down election information for both the person that is mildly interested as well as the political connoisseur. Check out the balance of power in Congress as well as get the latest poll results. To my chagrin FOX is charging .99 cents for this app which I think is un-American. Finally, CNN has released an app for all three major platforms: iPhone, Android and Blackberry, called CNN Election Center. This is the first major news brand that has released an app for all three platforms simultaneously. Get up to the second updates on House, Senate, and gubernatorial races based on zip code. The app has also been updated to include key ballot measures as well as allowing users to find their polling locations, so if you have already downloaded the app make sure you update it before Tuesday. I suggest using the “follow” these races feature before Tuesday for easy access to results on election day. The CNN election Center app is free on all three platforms so download it today. For more information visit www.cnn.com/mobile. These three apps will no doubt keep you up to the minute on the election results this week no matter where you may be. Make sure you find you voting locations and take advantage of your right to vote. How will you be following the election this year? Will you go out and vote?